The depot was opened in 1907. The railroad was known as the Wisconsin Northern or by its nickname, "The Whiskey Brothers." In 1921, the railway was sold to the Soo Line Railroad. A mix of freight and passenger trains ran daily. At that time, all freight came in by rail, as there was no truck service until the 1940's. Draymen would deliver the freight from the depot to the various businesses. The U.S. mail also came in by rail. The depot was closed in 1963. In 1974 the Gresham Woman's Club and the former depot agent, Russell Ferrall and his wife, Grace, were instrumental in getting the depot moved to this site. Many community members pitched in to help with the move. It's original site was just south of here, on top of the hill. 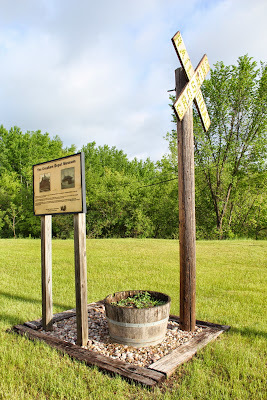 The Gresham Depot Museum marker is located at the Gresham Depot Museum, 1311 North Main Street, Gresham, Wisconsin 54128. See also, Gresham Depot Museum, also at this location. This location is Stop No. 16 (P) on the From the Pineries to the Present Tour No. 1. The depot is located in Gresham, Wisconsin. Thank you for posting this! I am Russ & Grace's granddaughter & very happy they helped preserve this little slice of Soo Line history for future generations! Awesome website. Thanks for your work!